3 Bedroom Waikoloa Beach Villa with Hilton Pool Pass thru 2018 and 2019, Sleeps 8, Swimming Pool, Hot Tub & More! 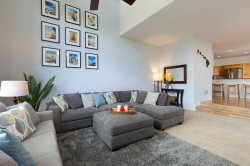 Waikoloa Beach Villa C1 is sprawled out over 2,200 square feet and features three bedrooms, three full bathrooms and comfortably accommodates up to eight guests. From the front porch, guests enter the home where there is a warm and inviting living room, with cozy furnishings surrounding a large flat screen TV. The well-equipped kitchen is made for entertaining, and offers high-end appliances, a breakfast bar with seats for four, and the dining area with seats for six. Just outside the living room is a covered lanai with a built-in BBQ and a dining table for four guests. Located upstairs is the master suite and and a junior suite both with private bathrooms. There is a comfortable king-size bed, a private balcony with amazing views, and a private bathroom with a walk-in shower and double vanities off the master bedroom. The junior suite has a queen-size bed and a private bathroom with a tub and shower combo. Our unit is well-appointed with everything you will need to make your visit just perfect. A stocked beach locker with beach chairs, boogie boards, ice chests and beach towels. Just a quick stroll to the very popular 'Anaeho'omalu Bay (A-Bay) for lots of beach activities. There are two swimming pools, two hot tubs, and a fitness center. Also, all of our units have a well-thought-out guidebook to the local area, complete with sections describing Waikoloa Beach Resort and all its offerings, important phone numbers, Big Island life information, a guide to beaches, shopping, activities, Luau/Dining, and Golf. Working with the staff of Resortica Hawaii was a pleasure! The members of their team are friendly, professional, and provided prompt email and telephone responses to our inquiries. We had no problems whatsoever and would highly recommend them to anyone looking for a hassle-free travel experience. We stayed in unit C1 at the Waikoloa Beach Villas in February 2018. The unit is well-appointed and has all the little extras you might need when away from home. It is conveniently located right beside a pool and hot tub. The grounds are lovely and well-maintained. The condo is an easy walk to a variety of shops and restaurants. Although it is right beside a road, there was almost no traffic noise at night. Plenty of beach chairs, toys, coolers, etc. provided. We had a wonderful stay and would recommend it to visitors to the Big Island of Hawaii. Resortica was an absolute pleasure to deal with. The minor issues that arose in our unit were dealt with in an expedient, professional and friendly manner. The condo we rented was absolutely perfect for our needs. Very nice unit with a great location. I would definitely stay here again.